“It is so exceptionally strong, it allows doctors to see into the brain like never before,” he said. Many people have heard of or even had an MRI scan but may not know much about the medical machines. Not all MRI machines are created equal, and the new one here in Las Vegas, which was built in Germany and paid for by volunteer donors from the community, is the first of its kind in the U.S.
Akin to the Cleveland Clinic — ranked the No. 2 hospital by U.S. News & World Report — Las Vegas’ Cleveland Clinic Lou Ruvo Center for Brain Health recognizes that having the most advanced equipment is crucial to providing the highest quality of patient care and advancing research. That is why Larry Ruvo, co-founder of Keep Memory Alive, and Cummings hosted a celebratory ceremony to unveil the new cuttingedge Siemens MAGNETOM Skyra MRI scanner. As sleek as the Frank Gehry-designed building that houses it, the new MRI will further enhance the work being done at the Ruvo Center and support its mission to put patients and their families first. The MRI provides a unique, comfortable experience to all patients. With a larger opening for patients to enter, the machine features ample space to prevent patients from feeling confined, making the imaging process easier on them and, in turn, easier for the imaging team. In addition to more spacious accommodations, it has a quiet scan feature that reduces the noise drastically, which also improves the imaging procedure for patients. 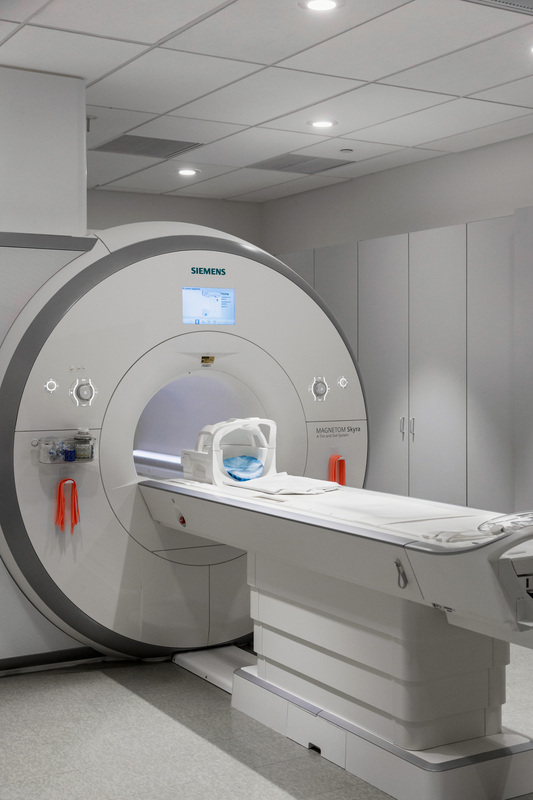 Not only is the machine’s scan experience more pleasant, the Siemens Skyra MRI was specifically designed to increase imaging productivity by up to 50 percent. With the machine’s innovative technology, the pre-MRI tasks are now fully automated, allowing the imaging team to optimize appointments and cut down exam times. And, because the Siemens Skyra requires less time to scan patients, the number of patients who can be seen by the Ruvo Center’s imaging team will increase. The installation of the new machine required a total revamp of the Ruvo Center’s imaging center, including the removal of walls and a new electrical system to accommodate the machine’s complex features. After four months of hard work and collaboration, the facility now has its upgraded imaging suite. Additionally, Ruvo Center MRI technologists traveled to the Siemens Learning Center in North Carolina to receive specialized training on how to properly “drive” the machine. Following completion of that training, the team then went to Cleveland Clinic’s main campus in Ohio to practice their new skills on a similar device, ensuring they were familiar and prepared to utilize the Skyra in Las Vegas. Some may wonder why anyone would go through all of that trouble and huge expense for just one MRI machine. “Simple. Mr. Ruvo has never been one to settle for anything less than the best — he delivers only the highest-quality products, ranging from the wine sold at his Southern Glazer’s Wine & Spirits here, to the unsurpassed healthcare delivered by the Lou Ruvo Center that bears his father’s name,” explained Cummings. While the work being done at the center is already revolutionary and has made headlines around the world, putting Las Vegas on the medical map, the possibilities made available by the Siemens Skyra are tremendous. “Most MRI scanners have similar capabilities, but the Siemens Skyra performs to an unparalleled standard. … The difference between the Skyra and the center’s old magnet are similar to the differences between Windows 10 and Windows 7,” said Cummings. The statistics are more than worrying; they are truly frightening. According to Cummings, one in nine Americans older than 65 years of age has Alzheimer’s today. By 2050, the number of those living with the disease is expected to reach 14 million and the cost of caring for these individuals will grow to a trillion dollars annually. With this alarming growth, there never has been a greater need to find a cure. Currently conducting more than 20 clinical trials in an effort to combat brain disease, Las Vegas’ Lou Ruvo Center is one of the leading and largest clinical trial sites in the country. Imaging is a critical component of these trials and plays a key role in determining drug trial success. “The Cleveland Clinic Lou Ruvo Center for Brain Health will continue to be a game changer in brain disease treatment and research,” said Cummings.